18 count canvas, design area is 10" x 12.5". LIsting as used only because I have owned it for a while, it is in pristine condition and has been carefully stored in my stitching closet. From a non-smoking, cat/dog friendly home. Handpainted from Liz/Tapestry Tent, this is a Liz Goodrick-Dillon design. 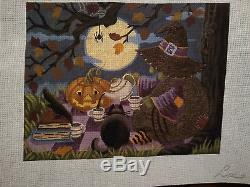 The item "Witch's Tea Party Liz Goodrick-Dillon Handpainted Needlepoint Canvas" is in sale since Wednesday, December 12, 2018. This item is in the category "Crafts\Needlecrafts & Yarn\Embroidery & Cross Stitch\Hand Embroidery Cloth & Canvas\Plastic Canvas". The seller is "cathys58" and is located in North Richland Hills, Texas. This item can be shipped to United States.